GSE’s main goal is to be self sufficient, so that it will be the least possible dependent on elements from outside. The centre will have its own passive and active sustainable energy systems and because of this it will not be connected to the grid. For example GSE uses passively the heat of the sun and coolness and heat of the earth. Certain thromb walls will be implemented in the settlements, that are heated by the sun and will heat the house in winter and there will be coolingsystems which will be supplied of cool air from the earth. 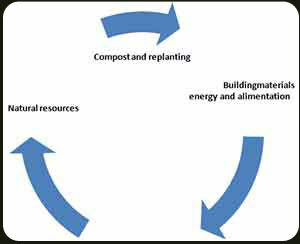 The natural lay-out of GSE is based on the Permaculture principle of Bill Mollison. Permaculture comes from “Permanent culture” and is related to forest gardening where different eatable plants and trees grow mixed together like in a forest (see “Permaculture’). Apart that it will supplie the center of food, it will create an eco-system which is optimal for the fertility of the soil and the waterlevel in the ground. The whole year round food comes from the harvests of the land and in the periods when there is less produce, in winter primarily, vegetables and fruit will be grown in a greenhouse. GSE focuses on an integral continuity of natural resources which are present in the centre itself and in the direct surrounding.